The practice of schooling horses is the basis of all equestrian disciplines. Even if they are not destined to be top dressage horses, every horse will benefit from basic schooling. Age, fitness level and type of horse must be considered. Schooling is basic education for horses and has several benefits. It helps them to become responsive to the rider’s aids (communication with the horse); making the horse safer and less tiring to ride. Schooled horses look good because the schooling exercises help their fitness-they become more muscled and supple through this work. Horses that have been schooled are less likely to get prematurely ‘dipped’ backs and other muscle weaknesses, because schooling helps them to carry themselves in a more co-ordinated and balanced way, which results in less strain. Naturally, a rider needs to know what they’re doing to be effective in their schooling! They must give the correct aids at the right time, in the right sequence and with the correct pressure. Riding as many different horses as possible helps each rider to gauge how well they are communicating and what they need to work on to improve. Likewise with schooling from the ground-it takes time and practice with suitably qualified instruction before attempting this. For those who are new to equestrianism, a good local riding school is worth a visit. Find out when they have lunge lessons (schooling on a circle with or without a rider) dressage clinics or open evenings. Look out for dressage displays and competitions, both locally and nationally, where well-schooled horses and ponies can be seen in action. Riding clubs hold events, too, where much can be learnt from watching the horses gait; learn how they move each leg in walk, trot, canter and gallop. Observe their changing shapes! There are different schools of thought to this-simplistically, though, less is best. A horsemoves on its own without being attached to various lines and gadgets, which, if used inappropriately, can do more harm than good! Riders and instructors must wear approved safety hats, riding boots and preferably gloves while schooling as well as appropriate clothing. Horses may need to wear boots too! Long reining-walking behind a horse while holding 2 long reins. 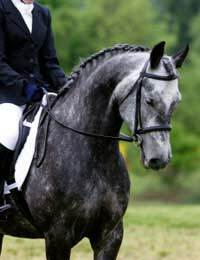 Lunging-working a (ridden or unridden) horse on both reins equally, on a circle, with the use of a special lunge line attached to a cavesson noseband. Supported by a lunging whip in the opposite hand. Lateral work-training the horse to move sideways. Each level of schooling needs to be approached calmly and professionally. It is important to avoid potentially dangerous situations that may cause a horse to panic. Quiet,confident, handling encourages a quiet, confident, horse. For anyone interested in schooling horses, the chance to watch a horse being professionally free schooled over jumps is not to be missed. This method is sometimes used to advertise the disciplined athleticism of a stallion, at stud, for example. It is used particularly in the training of young horses-to teach them to jump freely and in a well-balanced manner, before adding the complication of carrying a rider! The schooling of horses is an exact art. Preparation, consideration for safety and equestrian expertise are necessary factors to get the best out of both horse and rider. To move as one with their horse, for horse and rider to become totally tuned in to each other, is every equestrian’s dream. That is where schooling can lead to. Although schooling can be good fun it deserves to be taken seriously. why don't horses like water in their faces...please answer ASAP! Please can I ask how much money do they make?